Can you retrofit my existing lighting system with LED lights and use the wire and power console I already have? As long as the wiring is in good shape, we can absolutely retrofit your existing system with LED lighting. That is the most cost-effective solution. Can you mix LED and incandescent lighting together on the same system? Yes. Sometimes, a customer may want special path lighting that isn’t available in LED. Most of the system can take advantage of LED, while still having the aesthetic where desired. Also, those with a smaller budget can convert to LED in phases. Can I keep my existing lights and just change the bulbs to LED lamps? Yes, we can do that as well. These types of LED lamps are not as robust as other fixtures, but they are an option for a smaller budget. When is the best time to install architectural lighting? 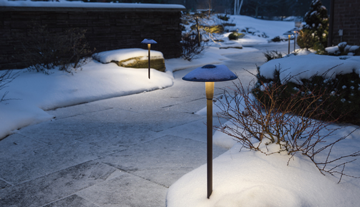 We install lighting anytime the ground isn’t frozen or covered in snow. In Cincinnati and surrounding areas, we install lighting projects year-round– even in January and February.